A bit over a year after its launch, the PCDS has seen more than 170 adults [see below on this website for more details of this group] on their way to getting a driver licence. In order to see what is happening with these people once they leave PCDS, we recently followed up a group of 30 graduates of the service. Of this group of 30, sixteen now have their licence and had very positive comments both about their PCDS experience and the benefits of having a licence. This pass rate (72.7%) exceeds both the Auckland and the New Zealand average pass rates and is almost certainly better than for other people of similar backgrounds. But it’s not straightforward for everyone. Six of the group have failed their test and eight are still yet to sit their test. The mentors are very good, patient and helpful. They were very nice and having different mentors helped to build my confidence driving on test day with the testing officer. Awesome, very practical, very knowledgeable and reassuring. The mock test was very useful. It’s much better than other schools because PCDS mentors are very helpful in explaining what will happen during the actual test. Helping me to have a hassle-free commute to work. Taking children and neighbours to school. My independence so I can drive to work and anywhere else I want. I’m independent now and can drive at night if necessary. With the six who failed their tests, the reasons for failing included: taking a wrong exit on a roundabout (this person suggested more practice on roundabouts with multiple exits), parallel parking (3), failure to come to a complete stop at a stop sign (2), failing to give way (2), failure to follow speed limit, signalling on roundabouts, head checks and mirror checks. One person made ‘many mistakes’ and did not want to give details. Nonetheless, these people were generally positive about their experiences with PCDS, but did suggest some changes that were usually related to the reasons they had failed their tests. All except one are planning on re-sitting their tests in the near future. Most commented that they needed to do more practice in the meantime. Of the other 8 interviewees who are yet to sit their tests, the most frequent explanation was some version of ‘they haven’t got round to it’ for a variety of reasons including family commitments, childcare issues and starting a new job. Six of this group said they felt they were not ready to sit the test because of a lack of confidence and that they needed to do more practice. Particular areas people found difficult in their lessons: identifying and reacting to hazards, controlling speed, changing lanes, indicating on roundabouts, being aware of blind spots, mirror checks, gap selection, mirrors, parallel parking, steering control and keeping calm. Particular things they found useful: the feedback forms as reminders of what the learner needs to work on, the support offered by the mentors, the use of mock tests and learners especially valued mentors and instructors who stayed calm and were very experienced. Several suggestions were made about how to improve the service: using the same car for practice and the test, practising in the same area as used for testing, giving instructions before starting or pulling over during a practice (rather than while driving), doing more than one mock test and being picked up for lessons. I have been driving overseas for 12 years and it is quite different when you decide to migrate to a different country. I wanted to drive ever since I arrived in New Zealand but I was afraid that I might violate some laws that might affect my stay in this country. I have consulted some friends and locals and kept asking about driving here in New Zealand but I wanted the real thing; for a professional to tell me and assess my skills as a driver. That was the sole reason why I went with PCDS. Knowing that they take care of migrants, I knew that I was in good hands. After a few weeks, I took the test and passed. Having a full licence will make you feel like a new person. You feel much safer, protected and it will also give you a peace of mind. This will also be your key to travel around this beautiful country because you know that you can. Feedback on the programme is generally very positive with only a small number of criticisms which can be easily addressed. When people sit their tests, their pass rates are probably at least as good as the national average pass rates. The greatest concern are the people who are yet to sit their tests. Although they suggest a number of reasons for this, it appears that a lack of confidence is probably the biggest reason behind this lack of follow-through. Many say that they need more practice to build their confidence. PCDS need to decide whether this issue is part of their strategy and if so, how it is best addressed given the financial constraints of the programme. Khin Khin Kyaw Wai is a 45-year-old refugee from Yangon in Burma. She has been in New Zealand since 2009 along with her husband and son, with a second son since born here. As with all refugees, they stayed at the Mangere Refugee Centre on first arriving in Auckland. During this time Khin learned her driver licence theory in her native tongue although she was tested in English. Having successfully passed her theory test, she then faced the challenge of practising her practical driving skills before she could sit her final test and gain her restricted licence. Although she was highly motivated, she also felt overwhelmed by the difficulties of developing her driving skills. Without her licence, she had to rely on her partner to drive her if she needed to go somewhere such as taking her son to school, buying groceries or visiting friends. As often happens, life’s events such as a new baby also intervened, which meant a delay in achieving this goal. When her second son started school in 2016, Khin renewed her resolve and set out to complete her qualification. She started having driving lessons with friends about 10 months ago. It was very challenging to learn the road codes because her English was still poor and she didn’t know anything about cars. She bought a driving lesson DVD from VTNZ and learnt all the lessons and road codes. She then took five driving lessons with a private driving instructor, costing her $350 which was beyond her budget. A helpful cousin helped her to supervise her driving at least 2 or 3 times a week. However, she still felt very scared of taking the restricted driver licence test, especially as some of her friends had already failed it four or five times. An aunty who is a leader in the local Burmese community had heard about the Puketapapa Community Driving School (PCDS) and encouraged her to enrol in the programme. Following five PCDS driving sessions and three mock tests, Khin finally got to go for her driving test. In spite of being extremely nervous, she passed on her first attempt. With her restricted licence, she is now determined to make the most of her new independence. She is currently completing an English language course and once she feels she has sufficient language skills, she intends to pursue her dream of training to become a hairdresser. Khin is extremely positive about her experience with PCDS both for its modest charges and the skilled, supportive help she received from her PCDS-qualified instructor and volunteer mentors. In collaboration with our partner organisations, PETER is developing and administering a community-based driving school to provide a low-cost way for Puketapapa residents to successfully complete their driver licences. On December 5, 2017 PCDS was officially launched at the Roskill Youth Zone on Sandringham Road. The launch attracted a lot of PETER supporters and Puketapapa residents. The day included the official cutting of the ribbon of the first PCDS car by the Chair of the Puketapapa Local Board, Harry Doig. There is a strong body of research evidence on the value of obtaining a driver licence. Not only does it enable people to do things like get and hold down a job or support whanau at times of crisis, it also helps prevent them becoming caught up in an entry into the justice system that often starts with driving without a licence. Below is a selection of excerpts from the available research (sources below). Young drivers are over-represented in road crashes in NZ. They comprise 13 percent of New Zealand’s population and 14 percent of New Zealand’s licensed population, yet were involved in (regardless of fault) 33 percent of fatal crashes, 35 percent of serious injury crashes and 39 percent of minor injury crashes. These crashes have a large social and financial cost. In 2011/12 fiscal year, injury crashes where a young driver was at fault resulted in a cost of over $776 million. The number of young people facing barriers to completing licences in most deprived areas estimated to be between 70,000 and 90,000. ACC active entitlement claims for young drivers amounted to over $37 million during the 2011/12 fiscal year. Traffic offences are the highest-volume offence type convicted and re-convicted through the courts (42%). They are mostly sentenced to community sentences and fines. Additionally, 2.7 million infringement notices were issued in 2010, mostly for traffic offences, with 1.1 million unpaid that year and filed by the court for enforcement. In 2013/14 10,300 offenders received a community work sentence for driving offences (a third of all community work offenders). Roughly 20% of re-offending is traffic-related. Much of the re-offending is linked to the sanctions themselves. Imposing fines or disqualifications create situations where further offending is more likely. From 2009-2013, 97.1 % of youth graduated driver licence breaches resulted in an infringement offence, of which 72.8 % was referred to court unpaid. 0.7 % had a positive compliance outcome and 0.5 % were referred to court for prosecution. 39% of offences committed by 17-24 yr-olds were for traffic and vehicle regulatory offences; driving without a licence is the most common conviction for 18-24 yr-olds. 56% of those that appear before court receive a monetary fine similar to cost of completing a full licence. Employers in trades jobs (e.g., infrastructure, construction, etc) where the proportion of jobs requiring a licence is higher again, are facing significant skills shortages in Auckland and Christchurch. Over 6000 unskilled and semiskilled labourers are estimated to be required in Auckland in the next 5 years to support current infrastructure project projects. The evidence is consistent, strong and very clear: having a valid driver licence is an essential passport to being a successful citizen in New Zealand society. Bealing, M. (April, 2016). The driver licensing challenge. Wellington: NZIER report to MBIE. To raise levels of employability, independence and self-confidence of participants. So where is PCDS up to now? In February 2018, Honey Raslan was asked about what progress had been made in 2017, what is planned for 2018 and what they have learned along the way. Who comes to PCDS courses? While PCDS is open to anyone, it also aims to reach out to a range of groups who have face particular challenges in obtaining their driver licences. In particular, PCDS aims to involve members of the Puketapapa community who have difficulty accessing driver education programmes for a variety of reasons. It is important therefore for PCDS to monitor who attends the programme and the impact of the programme. Below is a summary of the 84 participants who had enrolled in the programme from its launch up to the end of March, 2018. About three-quarters enrolled as Restricted Licence holders, seeking practical driving support; 11 were Class 1 Licence-holders wanting driving support, 7 enrolled in a Road Code workshop and 4 wanted an overseas conversion. About one quarter (24) were male and 60 were female. The age distribution was reasonably spread, with the biggest groups being those aged 35+ years. 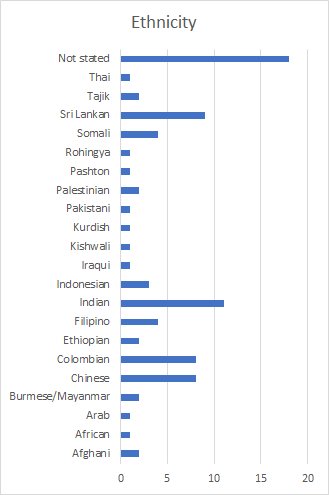 In terms of ethnicity, there is a very wide range of groups, with the largest representation (11) Indian, followed by Sri Lankan (9), Colombian (8) and Chinese (8) ; ; 18 did not report on this characteristic. Although there was a large range of ethnicities reported, nearly half of the group reported English as their preferred language; 28 did not report on this. 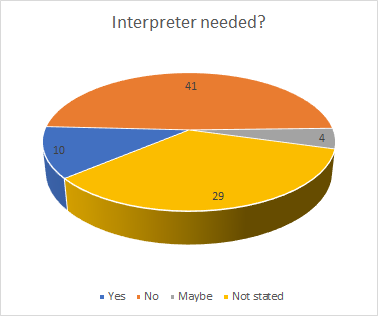 Asked if they needed an interpreter, only 10 said they did and four said ‘maybe’; all the rest said ‘no’ or did not report. Only three of the 84 participants were born in New Zealand, with a similar number as immigrants (26) and refugees (24); 31 did not report on this factor. Finally, by far the most frequently reported source of information about PCDS was from PETER organisations, followed by friends and relatives. Of the 20 enrollees in a Driver Licence workshop held in late 2017, 18 participants were women. All were new to New Zealand and most were refugees recruited by the Umma Trust. All but one of the participants had a first language other than English. Their average age was 32 years and all but six were from Puketapapa or an adjoining suburb. PCDS is part of PETER's collaborative network. So what is the value of working collaboratively for a group like PCDS? Our Data and Evaluation person John Benseman talked to some Migrant Action Trust (MAT) staff and office-holders who have been involved with PCDS.